their students may help by creating strategies to aid in this style of task completion. this common, and potentially self-defeating, academic behavior. fluence suggested by Solomon and Rothblum (1984). mains that hold generally negative connotations. declined until a peak was reached and errors began to increase. overwhelming, respectively, thus hindering performance. varying optimal stress levels for accurate memory retention. memory and spatial learning is not uniform in all individuals. General Activation (G-A), and General Deactivation (G-D). cognitive, and affective components” (p. 509). imposed deadlines optimally (Ariely & Wertenbroch, 2002). better mitigation of the possible negative impact. masters as well as doctorate level participants were surveyed. the first or second year of doctoral studies (see Table 1). lored interventions (Hersen & Bellack, 1988: p. 360). the PASS by including procrastination behavior covariates. come measured either in grade or completion success. required to complete the survey in one session sans time limit. tive testing mediums, such as psychology and sociology. PASS and the study-created questions. and suggest a more complex interaction exists. of procrastination cannot facilitate optimal performance. Predictors of self-reported grade outcomes. Note. N = 123. *p < .05, **P < .001.
gation will not foster the greatest levels of student success. Gainey, 2004) especially in regard to procrastination behavior. work with it within acceptable parameters. formance. 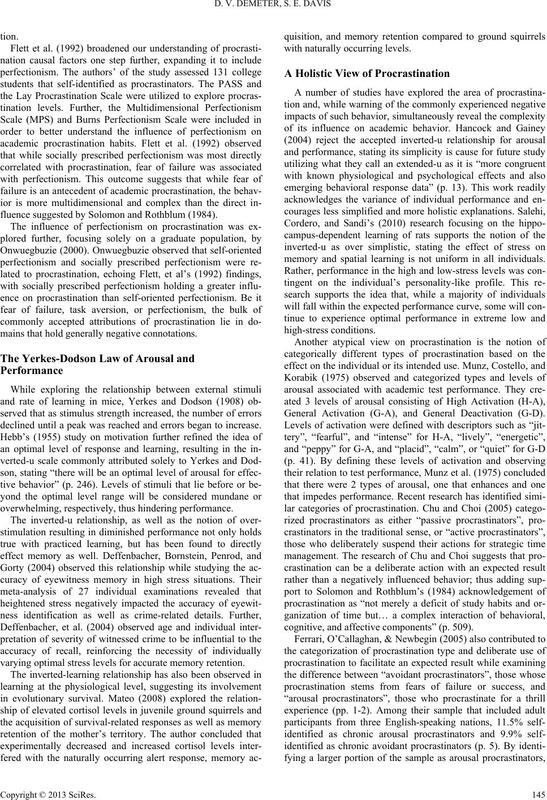 The Journal of Social Psychology, 145, 245-264.
nal of Social Psychology, 149, 195-211.
procrastination. 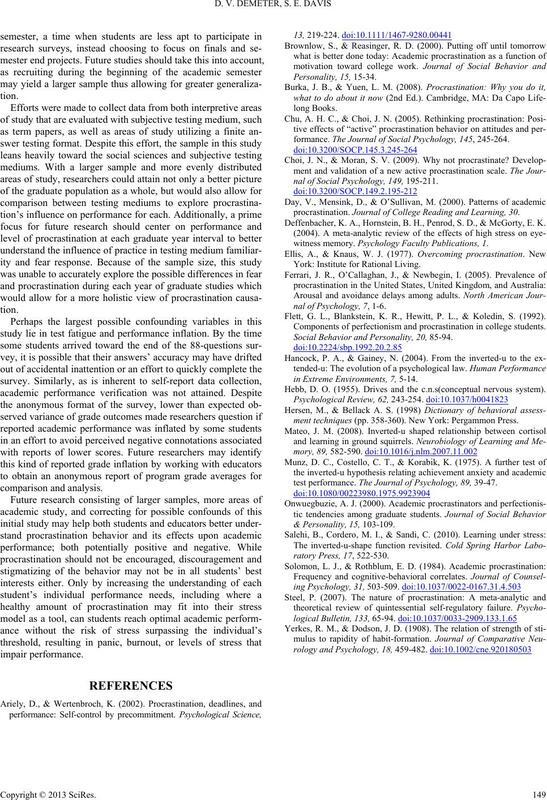 Journal of College Reading and Learning , 30. Deffenbacher, K. A., Hornstein, B. H., Penrod, S. D., & McGorty, E. K.
witness memory. Psychology Faculty Publications, 1. York: Institute for Rational Living. nal of Psychology, 7, 1-6. Flett, G. L., Blankstein, K. R., Hewitt, P. L., & Koledin, S. (1992). Components of perfectionism and procrastination in college students. Social Behavior and P ersonality, 20, 85-94.
in Extreme Environments, 7, 5-14. Hebb, D. O. (1955). Drives and the c.n.s(conceptual nervous system). ment techniques (pp. 358-360). New York: Pergammon Press. test performance. 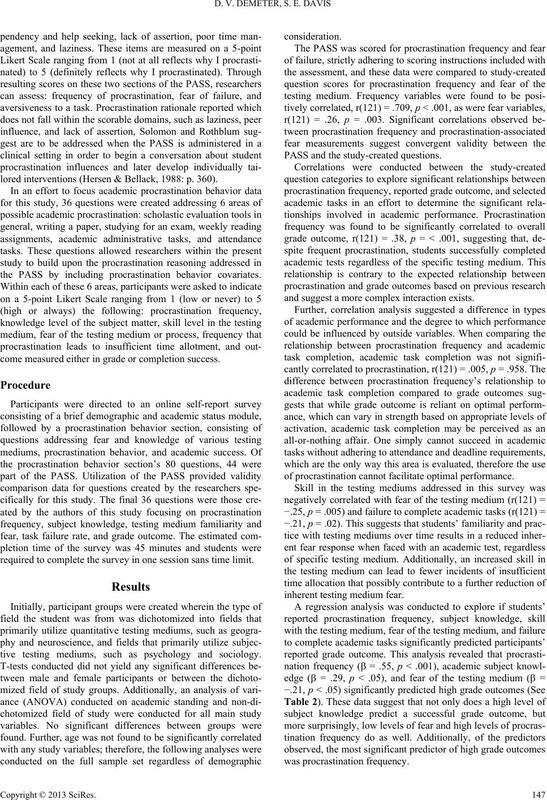 The Journal of Psychology, 8 9 , 39-47.